Bayfront Health St. Petersburg recognized National Trauma Survivors Day with the Human Spirit mural by Ya La’ford. While law and art might seem like career paths that are worlds apart, for Ya, they’re not. She’s passionate about community engagement and social justice, educating children and young adults, and understanding the human connection. These are the themes that are repeated continuously in her art, which is abstract, thought-provoking and full of geometric lines, shapes and patterns. If you’re not familiar with her art, here’s a short list. 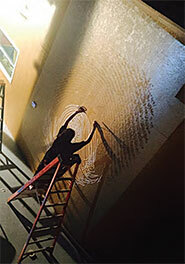 Behind the Morean Art Center just across from the glass hot shop, you’ll find Golden Wave, an enormous, 60-foot mural she completed for this year’s Shine Mural Festival. With its bold geometric pattern in gold metallic set against a black backdrop, Golden Wave is striking. 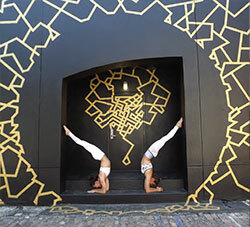 It’s a favorite photo-op for people of all ages and backgrounds, from families to body builders and yoga practitioners. But, the mural is more than a cool design motif. It’s meant to symbolize community power, strength, and the quest for perfection. All of Ya’s work has multiple layers of meaning. It’s not just art; it also tells a story. Take the underground tunnel that leads from Central Avenue and Ferg’s Sports Bar to Tropicana Field for a Ray’s game and you’ll find another intriguing mural – the Blue SUNnel. That mural, which features silver rays on a blue background, is a metaphor for light at the end of the tunnel. “It’s about finding hope even in the darkest places,” says Ya. She also has a mural at Bayfront Health St. Petersburg. Human Spirit incorporates handprints from nurses, doctors, trauma survivors, and caregivers and speaks to the healing power of art in helping patients move past pain toward recovery. 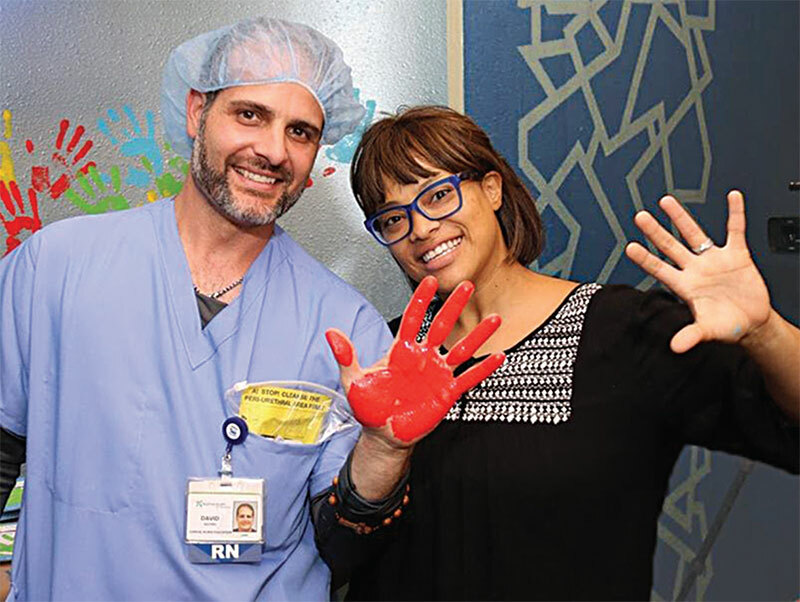 The hospital commissioned her to paint the mural in recognition of National Trauma Survivor’s Day. 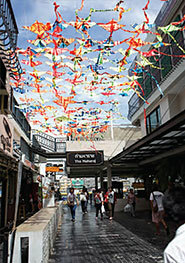 Universal Language, a public art installation in Thailand. Ya was born in the Bronx in New York City to a high-achieving family with parents who expected their kids to study hard. Her brother is an ophthalmologist; one sister is a lawyer, and another is a forensic anthropologist. Her father’s influence can be found throughout her art, which is “embedded with math and science through my use of geometric lines, shapes, and patterns,” says Ya. A passion for art also runs in the family. Both of her parents are originally from Jamaica and now live in South Florida. Ya grew up spending time in the Bronx; Kingston, Jamaica; and the Miami area. Her grandfather, John Dunkley, is considered one of Jamaica’s most important historical artists. His work is currently on display at the Perez Museum in Miami. Yet at the same time, she feels strongly about taking her art ‘outside’ especially to reach a demographic that wasn’t being served. “A big part of my heart wants to share art with the community,” she says. She has certainly shared her heart with the St. Pete community. 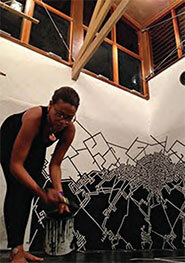 She’s especially proud to be working on public art projects with students at Mt. Zion Christian Academy and MycroSchool Pinellas High School, a public charter high school with a focus on drop-out prevention. Students from the MycroSchool helped her create a mural honoring Martin Luther King, Jr. It’s located on the side of the Dr. Carter G. Woodson African American Museum in South St. Pete. 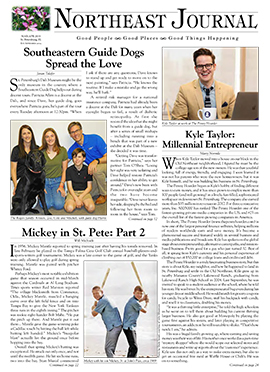 She also partnered with the Tampa Bay Rays and kids from Big Brothers Big Sisters to create Pitching Promises, an art installation at gate six inside Tropicana Field. Ya had the kids dip a sponge baseball in paint and ‘pitch’ it at the installation while they shouted a promise that they had selected, such as being truthful, successful, hardworking, or staying in school and graduating. 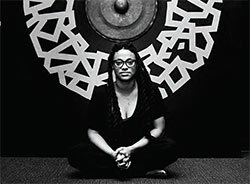 As a visionary artist and community activist, Ya says giving back to the community and creating a legacy that lives long after she’s gone is something that has always interested her. This year she expects to be making an impact of an entirely different sort. She and her husband Victor are in the process of adopting a child – possibly twins. It’s a life-changing decision. The two say they are looking forward to it.